I cannot figure out how to edit my previous post, but as of this morning (and last night), Cedar Grove at least is not yet active. Passengers who rely on the aging Mattapan High Speed Line for their daily commute will no longer need to stand idly along the tracks and wonder with extreme patience whether their ride is on its way. The Massachusetts Bay Transportation Authority announced Monday that all of the trolleys, which date back to the 1940s, have been outfitted with on-board tracking technology, allowing riders to pinpoint their precise location using smartphone apps. 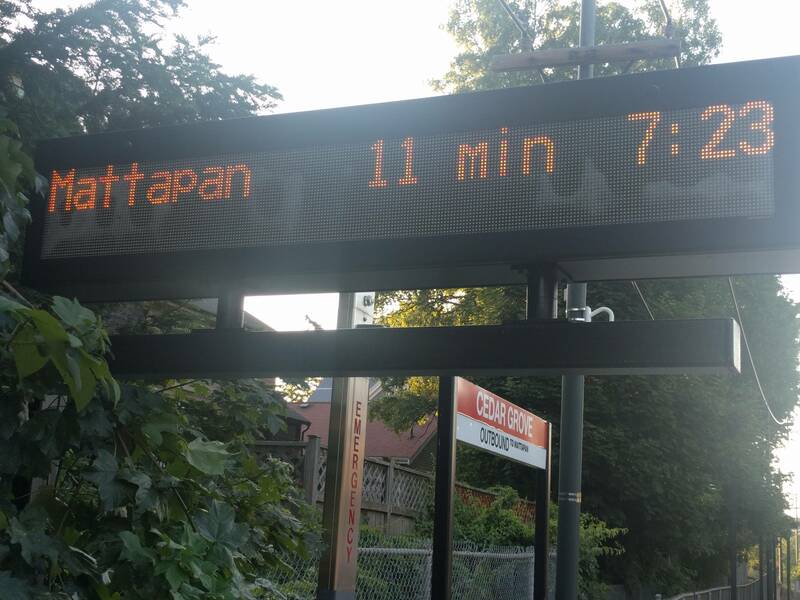 And by later this month, the MBTA plans to turn on digital countdown clocks at seven of the Mattapan line's eight stops, displaying vehicle arrival times. Three of the signs are already up and running. 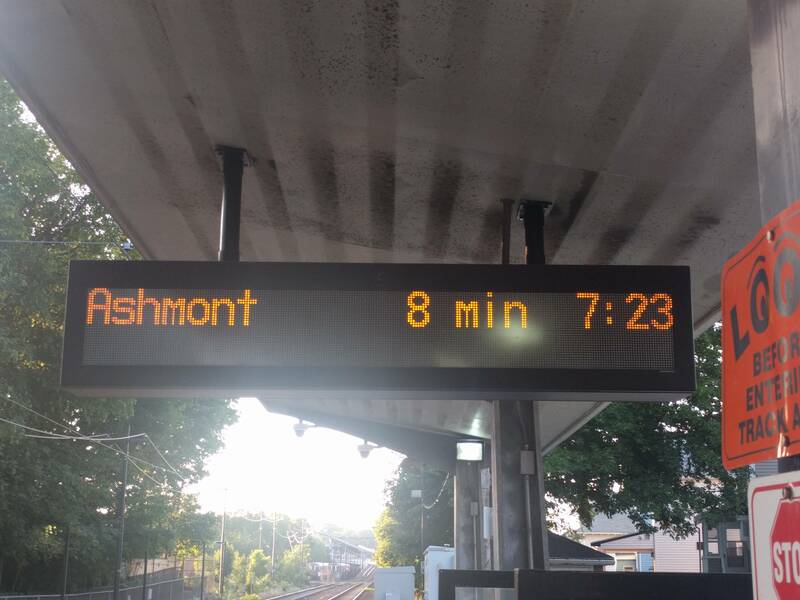 As of yesterday, Cedar Grove's signs are live Really hope they put a board up at Ashmont, too. I wrote a thing about replacing the MHSL with a Red Line extension. It borrows a lot of ideas from this discussion, but fleshes everything out a bit more and gets all the ideas in one place. I'd love to get responses from all of you, especially regarding cost estimates. I write software for MBTA, but don't represent them. Great web article you've done on a Red Line extension to Mattapan. This was under very serious consideration in the mid 1960's. I remember hearing about it a lot on Boston talk radio at the time. I remember Carney Hospital objected to what they claimed would be increased noise from a Red Line extension. That's about all I recall, but it was definitely a serious potential project at the time. skyqrose wrote: I wrote a thing about replacing the MHSL with a Red Line extension. It borrows a lot of ideas from this discussion, but fleshes everything out a bit more and gets all the ideas in one place. Most of what you've got in there completely nailed it. Awesome work! You really should see if you could get the attention of TransitMatters with that to see if it can get published in wider circulation. That's exactly the sort of thinkpiece Commonwealth Magazine likes to publish when they deep-dive into transit issues or partner up with TransitMatters for an op-ed about transpo best practices. As for "where's there a place for nostalgia? "...don't forget the Lowell National Historic Park has been running streetcars on Massachusetts terra firma under the tutelage of the PCC experts at Seashore since 1978 and could easily use those cars to spur expansion of the streetcar. City of Lowell has been mulling over plans to makeover the trolley into a general-purpose downtown circulator for all the employment and education centers sprouting up around the Canal District, as that's one of the fastest-growing areas of the city and projects to be their major 25-year downtown economic driver as redevelopment of the district accelerates. Any streetcar extension around the canals would start off by tacking on a short extension to loop at the commuter rail/LRTA bus station busway for direct transfers to the Purple Line and all LRTA routes at a proper multimodal terminal. Demographically, Lowell compares very favorably to Kenosha, WI with its very successful 2000-launched heritage streetcar, which links Metra's UP-North line at its outer terminus with a loop around Kenosha's TOD-driven lakefront business park. Actually, after doing some deep-diving on the Kenosha-Lowell demographic comparison on another board...it's a little shocking just how similar the two cities are, and how similar in layout and function the ex-industrial/future-multiuse Kenosha lakefront and Lowell canal districts are as circulator corridors. Kenosha economically started its rebound about 10 years earlier than Lowell did so is a little more potent and deep-pocketed today, but they began in the same place as a bottomed-out ex-mill satellite city with same general ingredients and same general long-term recovery track built around commercial & educational redevelopment of their downtown district. Kenosha is one of the best-fitting comparisons out there for what a Canal District revival with robust transit could look like in 2030 if Lowell make a full-throated commitment to it. Unfortunately the Lowell City Council demurred on proceeding with a study of the trolley scale-up when it came up to vote in 2015, so for time being it's status-quo with the museum as they haven't quite mustered up the courage to make a big bet. But Kenosha managed to commit to going big with a heritage trolley circulator that had to be built completely from scratch; Lowell already has a longstanding heritage network to start with that it can add to in cost-controlled chunks before netting the same end result. If Kenosha had a somewhat more robust economy for project starts to mitigate the risk on the Go For It decision on the streetcar, Lowell has a much lower barrier of entry and a lot more flexibility to defray costs with phasing their "GFI" decision. Should the city work up the courage to commit to gradual build-out of the trolley as their crown-jewel downtown circulator, wouldn't an ex-Mattapan PCC fleet of 8 be the absolutely perfect kick-off to the transition from museum niche to real everyday transit mainline? The maint expertise is already there with Seashore and only needs a new public-nonprofit agreement funded by the state and LRTA to scale-up Seashore's responsibilities to the scope of the completed service (almost like a miniature of the MUNI/Market St. Rwy. public-nonprofit relationship). The other historic cars from Seashore can still do their residencies on the circulator for the tourists. And it would only be a 45-minute trip from North Station to the waiting creme & traction orange PCC sitting at the Lowell Station trolley loop for Bostonians to get their transit-useful exposure to history. There is an intra-MA solution that'll allow the T to move on and give the High Speed Line superior service, while allowing the PCC's to stay in service in easy reach well beyond the +10 years of this final HSL overhaul. Not only stay, but directly graduate another local city's downtown to the transit big leagues in one fell swoop. The only outside-the-box consideration is that they'd be going outside the borders of City of Boston and outside the jurisdiction of the MBTA rapid transit district by coordinating efforts with Lowell. But if Lowell's willing to revisit that study vote and push for full workup of their circulator with gumption to proceed-to-build, and MassDOT is willing to invest in that less-known (but not exactly high-risk or necessary pricey) Lowell scheme...the timing ends up a juicy match for when the perma-fix decision has to be made for the HSL's future rolling stock when this final +10-year PCC overhaul runs out its clock. The locals do not want consolidated stops nor heavy rail headways. If the T could keep the car count up the line would continue to provide superior service to what any other mode is capable of. Granted, heavy rail is superior to no rail, but the current set up isn't broken (except for the miserable Ashmont station design, but I digress...). I've said it before, probably in this thread, that THE thing to do with this line is tack a small fleet of mini-10s (think CLRV vs. ALRV) onto the big type 10 order to run the service and build a real carhouse at Codman to maintain them. Then the future of the line is secure. Plus a real snowplow to replace the Type 3 would be nice. Last edited by CRail on Mon Jan 08, 2018 10:22 pm, edited 1 time in total. The CLRV idea is pretty great. It can't be too had to have a two truck LRV based on the type 10, I believe it's just a matter of the company going and designing it. The one question is, do we keep trolley pole or move the line to pantograph? CRail wrote: The locals do not want consolidated stops nor heavy rail headways. typesix wrote: Plus a real snowplow to replace the Type 3 would be nice. "Snowzilla" seems to be doing the job just fine on the HSL now that 2015 taught them to not slack off on keeping the work roster ready for winter. Used to be that the jet snowblowers were inoperable half the time because of poor maintenance attention, so their availability was perennially spotty whevever it did snow. But when they work...boy do they ever work. Well enough that you don't need a dedicated traction-powered plow trolley for the HSL. Now that '15 has chastened them to maintain the jet blowers like their lives depended on it, there's enough "Snowzilla" bandwidth available to fully take care of the HSL's needs without needing a dedicated trolley plow replacement for the retired Type 3's. The only reason the line gets bustituted at the drop of a hat during winter weather is because parts scarcity has them being extra cautious about snow getting sucked in from track level into the PCC's motors. PCC's actually perform excellently in the snow as pushers, and the revenue units could keep the line as well-cleared as the plow-attached Type 7's do on the Green Line when they slip non-revenue extras in between trains to bust up fresh street plow mounds at grade crossings or cycle them on the branches during the overnight to knock down storm accumulations before they get out of hand. But when you have such limited parts reserves one shorted-out motor hurts, so they don't risk it with the PCC revenue fleet like they do on the GL where blown motors can get replaced in a day. Using "Snowzilla" instead of a powered plow is actually better for prevention for the HSL for as long as it continues running PCC's because the jet blower melts everything on the trackbed instead of just scraping/pushing the snow off. Snow is still going to get inhaled into the undercarriage on a plowed trackbed because there's still snow below the railhead and re-drifting from all around the sides. But when it's all melted by "Snowzillla" down to the ballast and in a couple-foot radius around the track, there's very little left around to get reingested and it ends up saving a ton of motor wear. If anything, rapid transit div. needs to purchase or seasonally lease another 1-2 jet blowers to cover more track miles faster. That'll reduce the frequency and duration of snow bustitutions on the HSL if there's more blowers in use to finish up the Red Line sooner and be able to start on Codman-Mattapan sooner. Importing another powered plow isn't necessarily going to speed up the line's post-storm reinstatement any faster because plowing simply isn't going to outright remove all snow/ice from the trackbed out of intake range of those PCC motors like faster dispatching of "Snowzilla" to Mattapan will. Per NETransit, Brookville thus far has been the only bidder to submit a package for the PCC overhaul program. Bid end date hasn't hit yet, so awards won't be announced until later this winter. But we do have one supremely well-qualified streetcar vendor in the mix whose expertise is tailor-made for exactly this kind of "high-TLC" job. That's a very good and encouraging development. NETransit also mentions that 3234 is likely to be the pilot car for this program. Brookville has a pretty good reputation here in SF - they have rebuilt several dozen PCCs for Muni's heritage services.